Even your leisure activities have to provide you with some benefit or else why would you indulge in them? Luckily, dancing is a pursuit full of great perks. Take a look at the list below and find the benefit the most speaks to you. Once you’ve found your benefit, click the link beneath it to move on! Ballroom Dancing offers a unique, two pronged approach to wellness. Your exciting and kinetic classes will keep you sweating excess weight away as you move to our humongous catalogue of instudio music. You’ll discover confidence you never thought you had as you watch your waistline thin and your calves tone. As if that weren’t enough, dancing is incredibly healthy for your brain. Whether you’re 22 or 92, dancing incorporates pattern recognition and social scenarios which light up your brain and build powerful pathways to keep you sharp every day. Have you ever heard of someone saying that they didn’t want to get smarter? Is there a cooler way to smarten up than dancing? No? We couldn’t think of one either. Music is everywhere. The mall, the car, your office. It was there during your first dance. It was on when you had your first kiss. Your life is musical, and your memories are tied to the music that inspired you. 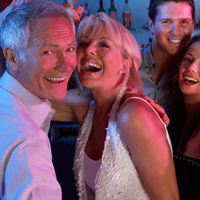 Harken back to your best days, and live a few more by dancing to all of your favorites! Endorphins. They’re those helpful endogenous opioid inhibitory neuropeptides that make you happy! They promote feelings of wellness and positivity. They improve sleep cycles. They reduce anxiety. How do you get them? Vigorous physical activity. What’s the best vigorous physical activity? Dancing. Come in and get happy. Meet new friends at our showcases, competitions, dinner dances and parties. We don’t call ourselves the best social dancing studio for nothing. If you’re looking to make new friends or refine your social skills you’ll find no better place to do it than our studio, and no nicer group of people than our students! Our judgement free, fun loving atmosphere has to be seen to be believed. The spine is important. Keep it and the surrounding muscles healthy and you spare yourself decades of back pain. Do you work at a desk? Are you sitting for long periods of time every day? Do you slouch? Your back may already be suffering for it. Dancing promotes a healthy posture and works those lowerback muscles to keep your spine straight and your shoulders back. Not only is it healthy, but it makes you look incredibly confident. Joints feeling stiff? Muscles feeling tight? Could it be because you’re not using them enough? Sure, you could go to the gym but who’s going to be there to stop you when you decide to skip it for a day, then two, then four? Ballroom Dancing at Arthur Murray doesn’t just give you improved elasticity and the synovial fluid which improves joint mobility, it gives you goals. It gives you something to come back to. It gives you a schedule, a routine. It gives you long term improvement to keep you limber for a lifetime. Dancing might not knit a broken leg, but it can prevent you from ever breaking it again. And it doesn’t stop in the bones. Tendons, ligaments, tissues dancing shocks your system in a gentle way that gets your blood pumping to the places that need it most. Every Arthur Murray studio has at least a few students who can attest to the healing powers of dance. Whether you’re recovering from surgery or a serious injury, dancing can help increase the pace of your body’s own healing process by a huge factor. Some people just want to dance! And why not? This is the pastime you’ve been looking for! Don’t spend another night on the couch watching other people dance. Make their adventure yours and learn to dance today!